Indian spices have a huge, global fan following and why shouldn’t they? After all, not only do they make food delicious, they also help you a lot in terms of health. This write up is dedicated to one such spice- Fenugreek and the difference it is making to the millions of people using it. Fenugreek is making the lives of diabetics easy. 4-hydroxy isoleucine, the amino acid present in this spice promotes insulin secretion thereby helping diabetics keep a check on their blood sugar levels. Fenugreek helps keep blood pressure in control. Potassium present in fenugreek is known for its ability to counteract the effects of sodium. A teaspoon of powdered fenugreek, first thing in the morning will help maintain blood pressure levels. Fenugreek helps fight joint ache. Alkaloids, phosphates, flavanoids, and most importantly Vitamin A are believed to have anti-inflammatory properties. Fenugreek is rich in these components and is found to be beneficial in curing joint pain and swelling associated with arthritis. Fenugreek can help with weight loss. The spice has tested positive for the presence of galactomannan, a polysaccharide used in weight loss pills too. Additionally, the rich fiber content of fenugreek promotes a feeling of fullness. Both these properties of fenugreek are found effective in killing hunger pangs. Thus, this spice can be a smart cheat for weight loss too! Fenugreek is great toxin cleanser. The mucilage of fenugreek can coat the lining of the gut and have a soothing effect on the problematic areas of the digestive system. Thus, it helps fight acidic reflux effectively. Fenugreek can help increase breast milk production. Diosgenin present in fenugreek is responsible for increasing breast milk production. So, this wonder spice can be of great help for new moms too. In addition to all this, fenugreek helps relieve sore throat, is known to be an aphrodisiac (although not proven, it has been known to increase sexual performance), and improves skin and hair quality too. 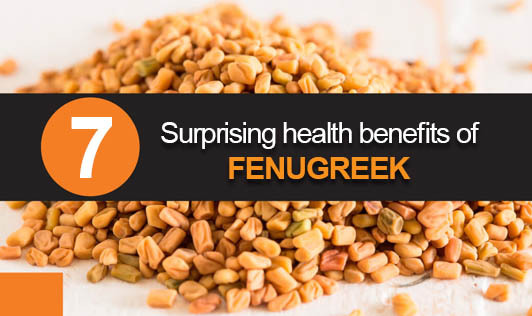 So, start taking fenugreek today to ensure yourself a complete package of nutrition, health, and beauty.